Tom Usborne is the founder of GeneratePress, a uniquely versatile and fast WordPress theme. With dynamic CSS caching and less-is-better defaults for fonts and icons, Tom offers GeneratePress for free with a subscription-based commercial version that adds well-conceived à la carte features you can activate as needed, such as Sections, which makes an outstanding base for your favorite page builder plugin. GeneratePress has earned a substantial user base, surpassing a million downloads last year. DK: How did you get started with GeneratePress? This is your first (and only) WordPress product, right? Were there any other theme developers who you took as a source of inspiration? GeneratePress is really unique in my experience. Was this you trying to scratch your own itch at first? TU: I actually built my first WordPress theme as a teenager — it wasn’t very successful, but it was a great learning experience and is 100% why I am where I am now. I created GeneratePress as a light foundation for my own client sites. I was using other themes as a base, but always found myself removing/working around more than I wanted to. Once I had it built, I figured I’d try submitting it to WordPess.org for free to see if others would be interested. It turns out that they were! I was able to stop taking on clients after a bit and began working on GeneratePress full time. DK: You reached a million downloads last summer and have seen nearly 250,000 more since then. Congratulations on that growth! How have you marketed GeneratePress to get the word out? TU: Very little! We do a little Facebook/Twitter advertising, but not much. A lot of our growth has been natural, which makes me really happy. GP is also very popular with a lot of page builder users, which has undoubtedly contributed to our growth recently. I like to think that our reviews help as well – we’re closing in on 600 5 stars on WP.org, which we’re really proud of! DK: As you should be. What does a million downloads translate to in premium subscriptions? Do you have plans to build additional products or develop other revenue streams? TU: We’re just about to hit 30,000 premium customers, which is super exciting. I do have one other product — WP Show Posts. It has a pro version, but the customer base is much smaller than GeneratePress, so GeneratePress gets most of my time. For now I’ll likely stick with those two products, with GeneratePress leading the way. In the future, who knows! Maybe some cool Gutenberg blocks. DK: I take notice when I see quality hosts plugging a theme. Building one that’s well-supported, fast, and lean — but also surprisingly versatile — seems like a recipe for pleasing everyone from the new WordPress user to hosts and page builder plugin developers. How do you keep a balance between feature creep and speed or simplicity? Is the option to disable features an important part of that balance? GeneratePress also seems a bit unusual for having so many options to turn things off. TU: It’s difficult to walk the line between having too few or too many options. I have to remember why GeneratePress started — if it gets to the point where I would choose something lighter for my client sites (if I still had clients), then I’ve gone too far in one direction. The modular structure of the premium version is something I really like — there’s no need to load functions and files which won’t be used. It likely doesn’t make a massive speed difference, but it helps to keep things simple. DK: Are there other themes you see as similar or leaders in terms of their flexibility and speed? TU: There’s tons of similar themes out there, but I like to think that GeneratePress has been able to keep things light and simple, while others continue to add more and more features. 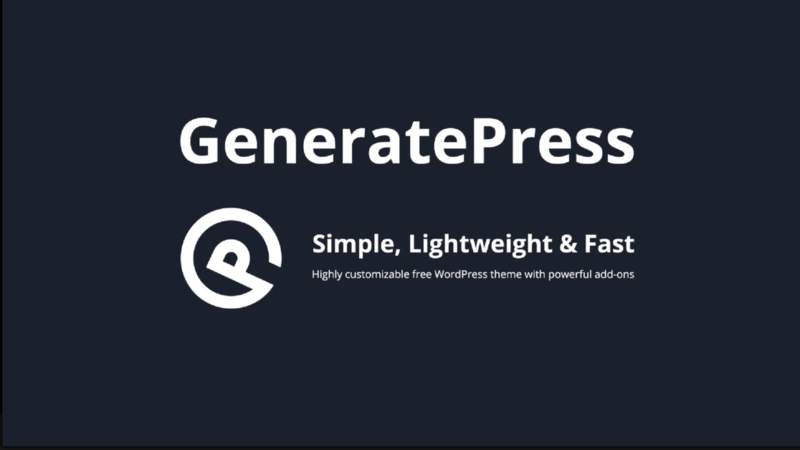 DK: How do you see the future of GeneratePress after WordPress 5.0? TU: I’m super excited about WordPress 5.0, although it’s coming up really fast! Gutenberg will make one of our premium modules obsolete (Sections), which is a good thing! It was originally built to allow the user to break out of the content area, which will now be achievable using core. The idea of simplifying the theme even more is awesome, which is exactly what Gutenberg will allow us to do. DK: What are you reading/watching/doing for relaxation or inspiration in your downtime? TU: Relaxation and inspiration usually come at the same time. We go for scenic drives a couple times a week (one of the only ways our 2 year old naps! ), which is great for talking out ideas and coding issues. I also play hockey a couple times a week, which is a great mental break.